Did you know: Australian Aboriginal culture is the oldest on this planet. 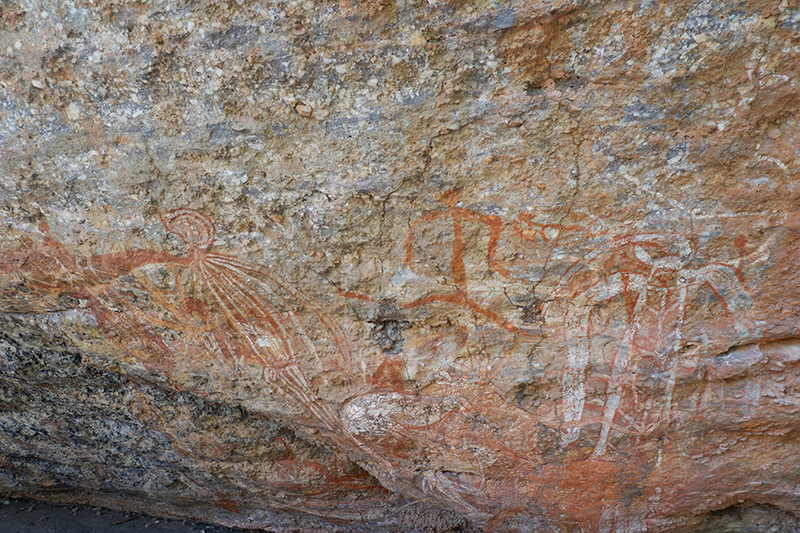 There is rock art dating back to over 60,000 years throughout the country, which depicts how the Aboriginal people lived and survived in the harshest of climates for way longer than any other society. Europeans only came to Australia in 1770; just 248 years ago. Indigenous people lived on this land for such a long time before, knowing exactly how to handle and adapt to extreme weather, and creating their own unique culture around Australia’s spectacular natural formations. Yet, somehow, so many people travel in Australia and don’t tap into its incredibly rich Indigenous culture and heritage. Aboriginal culture is everywhere in Australia; it is in the words ‘koala’ and ‘kangaroo’, it is in many city names, it gives an overwhelming significance to places like Uluru. There is so much depth to Australia that we have a duty to know about, as travelers to and citizens of the country. Aboriginal people went through a colossal amount when their land was taken by settlers. What happened was a genocide (which interestingly is not talked about in European schools – I only learnt about the enormity of it when I travelled to Australia). I believe that it is every traveler in Australia’s duty to learn about what happened as a form of respect to Aboriginal people. Learning about things like this is part of travel, and is essential to be sustainable and responsible travellers. Unspeakable things happened in the past, but the relationship between Aboriginal and European Australians is becoming a lot more positive. Victories like gaining Uluru back (one of the top things you can do to respect Aboriginal Australians is to not call it Ayres Rock, and to stop climbing the damn thing) show Indigenous people getting more and more respect in mainstream culture. There is still a long way to go, and a lot of attitudes need to change – but we are stepping in the right direction. 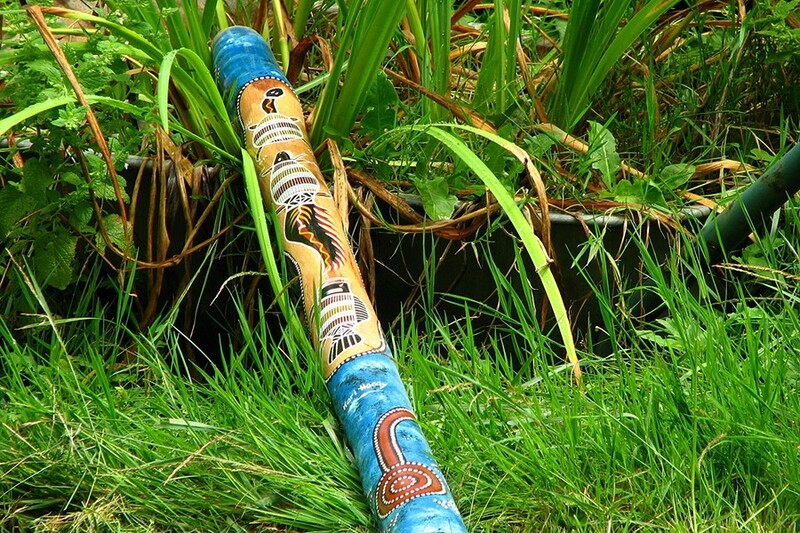 There are plenty of ways to learn about Australian Aboriginal culture. You can read books and articles on the web. You can meet Aboriginal people and chat to them about their culture and beliefs. And you can factor some of these attractions into your trip to Australia. Learning about the Indigenous way of life will fascinate you – with stories of how different tribes adapted to survive complete extremes of temperatures and precipitation, transporting themselves when the time was right, it is absolutely awe-inspiring. Not to mention the dreaming stories, the traditional ceremonies, and the beautiful rock art that has been created over tens of thousands of years… Aboriginal culture is captivating and learning about it should be part of every traveller’s Australia bucket list. Kakadu is a fantastic place to educate yourself about Aboriginal culture and heritage. Bordering Arnhem Land, one of the most culturally significant places for Indigenous people in the country, Kakadu is mainly Aboriginal owned, but works with Parks Australia. Ubirr is home to some of the world’s best rock art, which shows human interaction with the surrounding environment. It is astonishingly well preserved and displays the amazing harmony between the original owners of the land and nature around them. It is a great idea to enjoy Ubirr’s rock art on a tour led by indigenous rangers to learn about its history. Kakadu also offers ranger-led cultural activities and evening presentations. There’s plenty to get involved in throughout the park to learn about the traditional owners of this land. Kakadu has incredibly dramatic seasons: it doesn’t rain at all for half of the year, and then storms and rains heavily for the other half. Furthermore, it has a year round average temperature of 33 degrees. A society that managed to live in these conditions for so long is one well worth learning about. How to get there: Kakadu is about three hours form Darwin, the Northern Territory’s capital. It’s a huge national park – you’ll want at least three days to see all that it has to offer. It is a great addition to an Adelaide to Darwin road trip. If you don’t have a car, you can see the national park on a Kakadu tour from Darwin. I’ve lived in Sydney all my life. As a born and bred Sydney-Sider I often wonder how my home town looks to foreign eyes. Does she present as a show offy diva primping and preening while dressed in her Sunday best of stunning waterways, unique architecture and world class facilities? Does she seem like a soulless metropolis populated by robot-like suits barely surviving the work day while dreaming of 5pm? Is she the bogan cousin every Aussie family has who is a little rough around the edges but nonetheless endearing and always the life of the party? Sydney is all of these things, but so much more if you scratch the surface. Many visitors get caught up in the superficial glitz and never get a glimpse into Sydney’s rich cultural history. The traditional owners of Sydney are the Gadigal people of the Eora nation and on a Tribal Warrior cultural cruise a few select guests gain a privileged glimpse into their world. Tribal Warrior is a not-for-profit community organization dedicated to the preservation and promotion of Aboriginal culture. Guests on a Tribal Warrior cultural cruise are transported on the Mari Nawi (big canoe) across Sydney’s glittering harbour to Be-lang-le-wool (Clark Island National Park) where they will hear stories from their Aboriginal guide about the Cadigal, Guringai, Wangal, Gammerdial and Wallumedegal people of Sydney Harbour. Learn about the traditional food gathering techniques unique to our first people’s coastal lifestyle before being treated to a traditional Aboriginal cultural performance. This is not to be missed! Need to Know: Tickets are $60 for adults and space is limited so be sure to book ahead. There is some walking on the tour including across some unstable areas so be sure to wear sturdy shoes. The boat departs from East Pontoon in Circular Quay and will leave on time so arrive at least 15 minutes before your scheduled departure time. Bonus: Head to the nearby Art Gallery of NSW and check out their Aboriginal Art exhibition. Probably the ultimate Aboriginal attraction in Australia, Uluru has so much to offer visitors when it comes to learning about Indigenous culture. 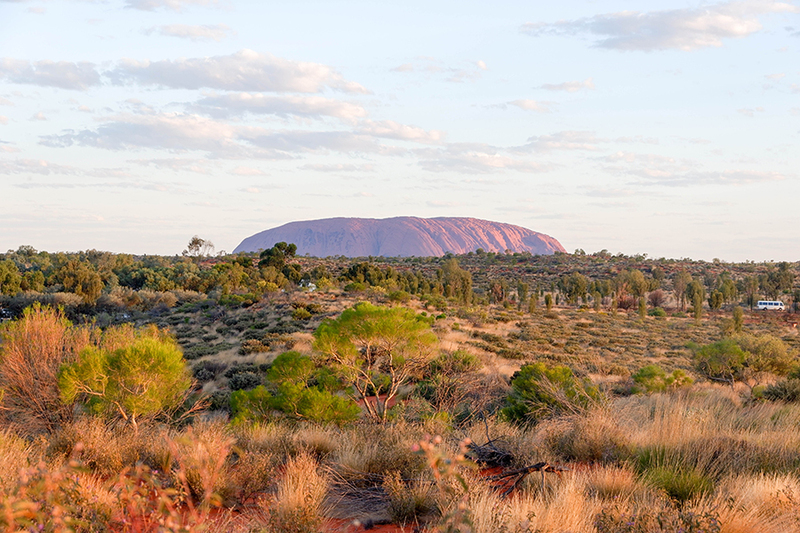 Visit the exhibition centre to read about how the locals regained ownership of Uluru, walk around the base to discover rock art and learn about how it provided food and shelter to Indigenous people, and bask in the beauty of the monolith and feel its spiritual connection. There is no experience quite like exploring Uluru. You can also take part on a free cultural Mala Walk which takes you around a specific area of the rock’s base and demonstrates some of the significant areas of Uluru that served as home for the Aboriginal population for so long. You will learn about how the Indigenous people handled living in the harsh desert climate and used the environment to their advantage. If you visit Uluru before Autumn 2019 (when the climb is officially closed), please don’t climb it. It’s not a plaything or a theme park, it’s a site of crucial spiritual significance for the local Indigenous population. Climbing it is like going on holiday to London and climbing up St Paul’s Cathedral, or standing on the top of the Grand Palace in Thailand. It’s disrespectful, and with the amount of signs at the bottom and articles on the internet, it’s obvious what the traditional owners wishes are. Getting there: Uluru is in the heart of Australia’s Red Centre, close (by that, I mean a four hour drive – that’s close in outback Australia!) to Alice Springs. You can take part in a tour from Alice, or visit the rock independently on a red centre road trip. If you’re in Melbourne and are keen on exploring the heritage of the Koolin nation (the traditional owners of the land the city was built on), consider signing up for the Aboriginal Heritage Walk at the Royal Botanical Gardens. The gardens themselves are located in the city’s south, on the site of what was once a traditional camping and meeting place for the Boon wurrung and Woi wurrung people. Run by Indigenous guides, the tour begins with a traditional smoking ceremony, to ward off evil spirits before taking tour goers on a stroll around the gardens. The guides will talk about the traditional values of the Indigenous people and their various uses for the native flora of Australia. Australia’s Indigenous population have a special relationship with the land, both spiritual and practical. In turn, native plants have traditional uses for food, tools and medicines, many of which are grown in the Gardens. The hour and a half walk ends with a spot of lemon myrtle tea – mighty refreshing after all that trekking around the garden paths. You can experience this tour daily from 11am, Sunday to Friday. It’s an hour and a half of your Melbourne itinerary worth investing into learning about Australia’s Indigenous heritage. The tours are priced at $35 for an adult and $12 for kids, with bookings required in advance. If you’re visiting the city, check out this where to stay in Melbourne post for information about the city’s best accomodation. It’s easy for visitors to Sydney to think that to see Aboriginal sites they must go somewhere more remote. But despite high rises and urban sprawl, culturally significant sites of the Eora people remain. You just need to know where to look. There are three Aboriginal rock engraving sites in Sydney that are easy to access, as well as being in very scenic locations worth a visit. The first is the Grotto Point Aboriginal engraving site in Sydney Harbour National Park on the Spit to Manly coastal walk. A ferry from the city centre whisks you across the harbour to Manly where you can walk to the 1000 year old engravings. The natural bushland setting is surprising so close to the city. At Sydney’s southern border, there is a large engraving site at Jibbon in Royal National Park. Like Grotto Point, animals such as orca, kangaroo and a stingray are depicted, as well as spirit beings. It’s a half hour walk on a marked trail, much of it along a relatively deserted beach, to get there. There’s a much smaller site near famous Bondi Beach. Thousands of people walk the iconic oceanside path between Bondi and Bronte (or onwards to Coogee), but few know to pause at the engraving of a single shark just before Tamarama Beach. Don’t walk on any Aboriginal engravings. Sandstone erodes easily and walking on them causes damage, as well as being culturally disrespectful. While the engravings themselves – at first glance – may not look extraordinary, once you know and understand the stories behind them and how old they are, your mind will be blown. Kings Canyon in the Watarrka National Park, is located approximately 300 km north east of Uluru and 450 km south west of Alice Springs. It’s a 4 hour drive from Uluru with little in the way of attractions in between. There are two popular walks located at Kings Canyon, the Kings Creek loop walk and the more challenging Kings Canyon rim walk. 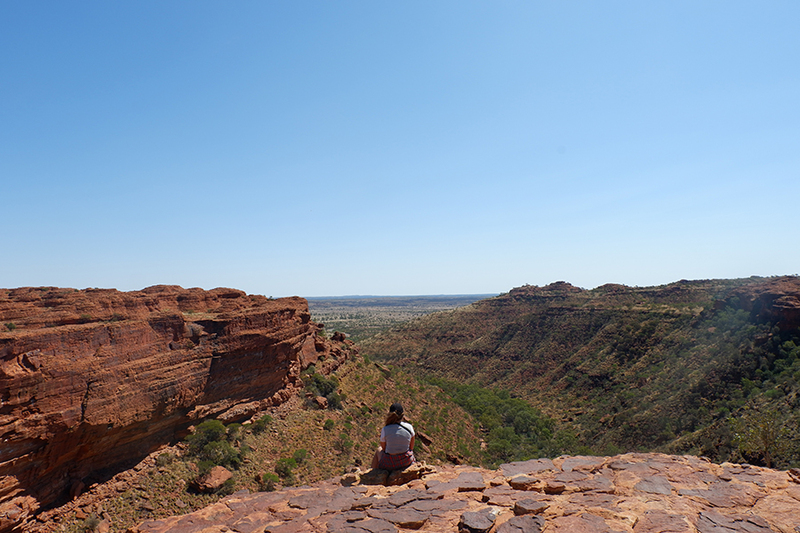 The walls of Kings Canyon are over 100 metres high, Kings Creek runs along the bottom. Parts of the Kings Canyon Gorge are located on a sacred Aboriginal site and therefore tourists are discouraged from walking off the designated walking tracks. Getting there: Kings Canyon is a long way from anywhere. We visited on a day trip with AAT Kings from Uluru and it was a 4 hour drive each way. The Kings Canyon Resort is located near Kings Canyon and offers accommodation ranging from deluxe hotel rooms to budget backpacker-style lodge rooms as well as caravan and camping facilities. 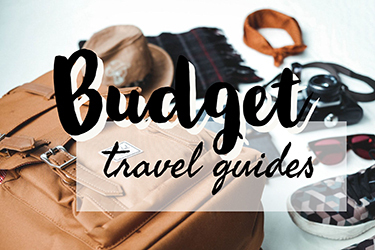 You can fly from all Australian cities to either Alice Springs or Uluru. 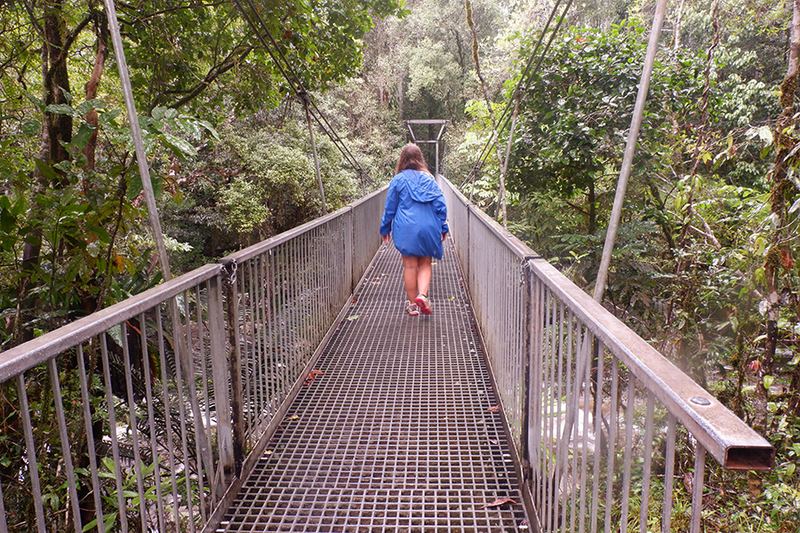 Aboriginal owned Ingan Tours shows visitors around the Tully Gorge National Park. Tropical North Queensland is an amazingly vibrant area, and has been the home to the Jirrbal rainforest people for centuries. Ingan tours shows visitors the ancient culture of the Jirrbal people and their special relationship with the environment – they believed that they were a part of the land rather than apart from the land. The experience details to guests how the Jirrbal people lived, socialized, what their customs were and how they treated ailments. A tour with Ingan demonstrates this in detail and shows a side to Australia that you won’t witness otherwise. Getting there: Tully is located inland from Mission Beach, which is about two hours south of Cairns. From Mission Beach, there is a bus link service, or else it is a half hour’s drive. 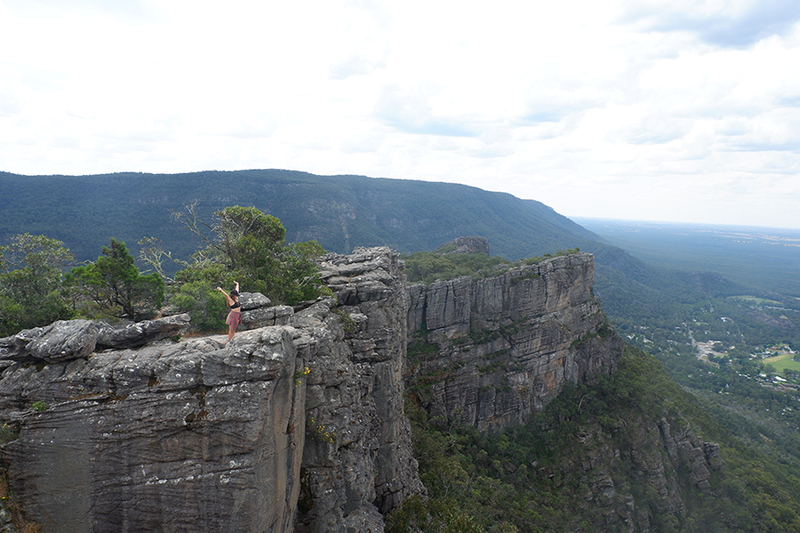 Gariwerd is a beautiful national park which is a highlight of many people’s Victoria road trips; and close to Halls Gap is the Brambuk Cultural Centre, somewhere to learn about the climate of this area and how Aboriginal people lived off the land here. 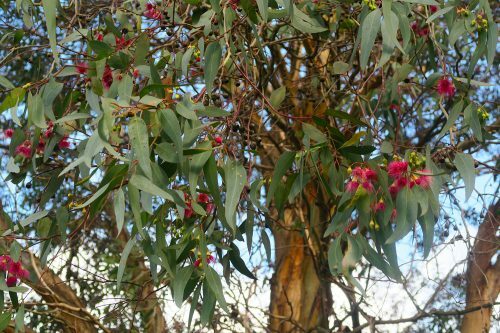 You’ll learn about how the traditional owners – the Djab Wurrung and the Jardwadjali people – utilised the six seasons of Gariwerd, which were designated to describe precipitation and temperature levels as well as plant flowering and fruiting times. 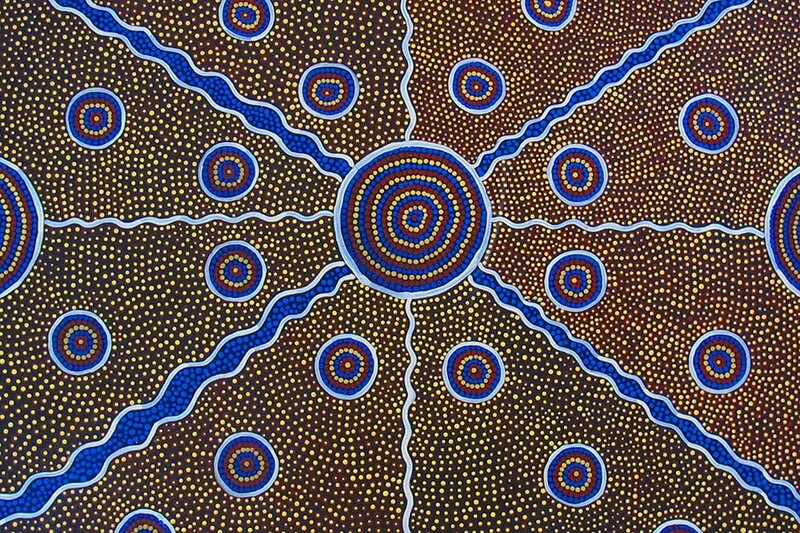 There are also details about the Bunjil the Eagle dreaming story of the creation of Gariwerd. One very good aspect of Brambuk is that it doesn’t sugarcoat what happened when Europeans came to Australia. It is very frank about the fact that it was a genocide and does not shy away from detailing how horrifically Aboriginal people have suffered at the hands of the settlers. It is well worth visiting for this. Only by learning fully about what happened can we begin to make amendments and build better relations for the future. Getting there: Gariwerd (known more commonly as The Grampians) is located about three hours north west of Melbourne in the Victorian countryside. This area, south of the Daintree Rainforest National Park, was home to the Kuku Yalanji people. The Ngadiku Dreaming Walks are conducted by the Indigenous people of the area and describes their dreaming; which are Aboriginal stories about the creation of the world. Part of the walk includes a ‘smoking’ ceremony that wards off bad spirits. The guide will detail the use of plants in this area, and describe the relationship of the indigenous locals to the land. The tour includes traditions like bush soap making and ochre painting, and appropriate bush refreshments are offered – bush tea and damper! Getting there: Mossman Gorge is around 40 minutes north of Cairns, which is often the start or end of many people’s east coast trip. The South Australian Art Gallery and Museum located in the centre of Adelaide is the best state collection as far as Aboriginal history goes – it features an extensive selection of Aboriginal art, including dot paintings which represent different features of the natural landscape of Australia. The South Australian museum has the most extensive selection of Aboriginal cultural items in the world, with lots of information about the objects themselves and further detail surrounding Indigenous culture and history. Broome is an area rich in Aboriginal history; and nobody details this story better than Bart Pigram, a Yawuru man from the west Kimberley town. Bart wants to tell the full story of Broome, a tale that not many travelers to the region get to hear. The tours enable you to see the town of Broome in a completely different light as Bart describes the town and areas around it from his own perspective; including how the Yawuru and Djugun people lived off the land throughout Broome’s dramatic wet and dry season. Narlijia means ‘true for you’ in Yawuru language, and Bart wants to create an experience that is completely true of the story of Broome. Getting there: Although Broome is one of the most remote towns in the country, it’s a traveler favourite. 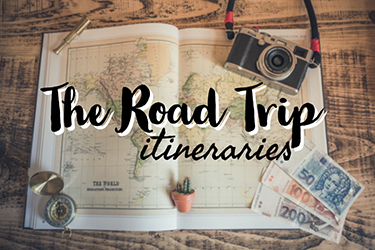 It’s often the last stop on a Perth to Broome road trip or the first on a Broome to Darwin drive (or the other way around of course!). Flights also leave from Perth and other state capitals. 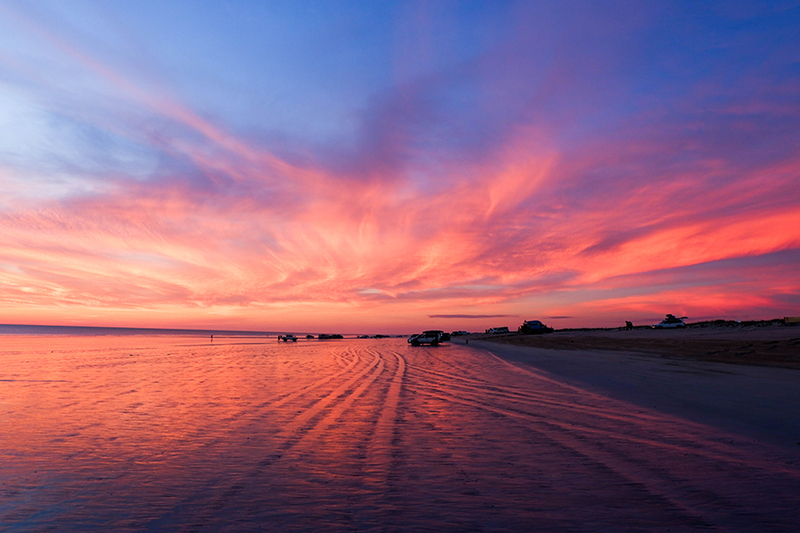 Located in Shark Bay, where the outback meets the sea, this remote eco-adventure tour showcases two of the most beautiful aspects of Australia – its nature and Indigenous culture. Choose from a 4WD tour, a didgeridoo dreaming night tour or various camping tours. All tours showcase the spectacular natural environment while also describing Aboriginal customs and traditions and dreaming tales of the area. Some tours even include didgeridoo lessons! Ran by Darren ‘Capes’ Capewell, a descendant of the area’s traditional owners, the tour focuses heavily on respecting Indigenous customs and maintaining a special relationship with the land. Capes was awarded Indigenous Tour Guide of the Year in 2006 and his tours are constantly rated the best thing to do in Shark Bay. Getting there: Shark Bay is a long way from everywhere; you’re looking at about a 10 Hour drive from Perth, the state capital, or an 18 hour drive from Broome. It’s a great addition on a west coast Australia road trip. Today, three tribal groups share the country: the Paakantji, Ngyuampaa and Mutthi Mutthi. Together they jointly manage the park with NSW National Parks and run the Aboriginal Discovery Tours which provides visitors with an insight into their culture, heritage and perspectives. To explore the Walls of China and many other sites within the park you will need to book a tour. These can be accessed through NSW National Parks. Walking on this lunar landscape is quite surreal. When the wind stops, you will find it soundless. A trip to Mungo National Park is an unbelievable experience. Add it to your Australian Bucket List! Head to the Visit Mungo official website for official details. How to get there: Mungo National Park, in New South Wales, Australia, spans 10,967-hectares and is fairly isolated. 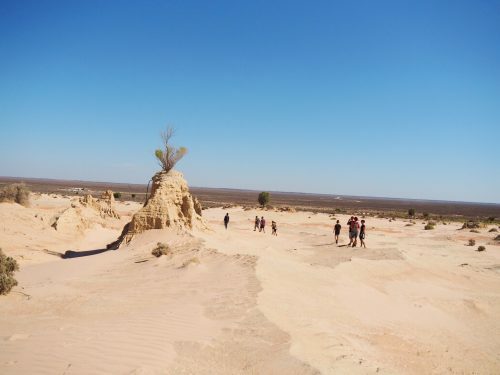 The easiest way to get to Mungo National Park is by car from Mildura. The drive will take 90 minutes or so along a dirt track which is accessible to regular cars during the warmer months. Rainfall can make it inaccessible via this route. These Aboriginal tours and attractions are great ways to engage in this rich and dynamic history of Australia; but they are really just the beginning. More and more Indigenous tours are establishing; and wherever you are in Australia you should be able to find some way to educate yourself about the traditional owners of the land. When booking an indigenous tour, make sure that it is ethical and helps the local indigenous, and is not just a money maker. Using tours that are guided by Aboriginal people or Aboriginal owned is a great way to ensure this. If they work with Indigenous charities or other companies that help Aboriginal people and the preservation of their way of life, even better. The museums and centres mentioned have good details about not just Aboriginal culture, but the atrocities that happened when Europeans first discovered the land. It’s very sad to learn about, and it made me deeply ashamed of my ancestors – and outraged that it’s still not taught in British schools. But it’s very important to know. The Indigenous people of Australia need respect, and it is something that all travelers to Australia should practice. 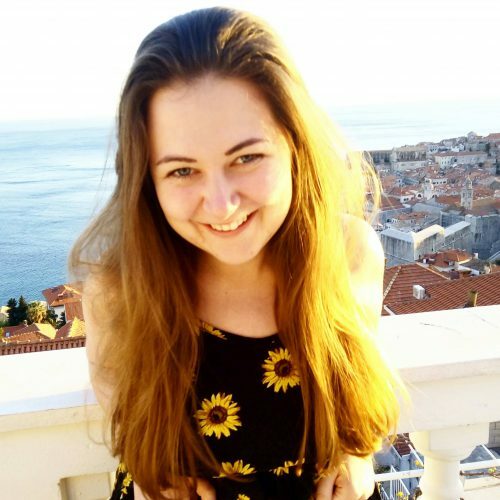 One of the huge benefits of travel is that we can learn about other cultures, about other histories, and we can start to understand one another on a global scale. If we don’t make an effort to do that, there’s no point in travelling. Learning about the culture and history of those who have been in a country for thousands of years is essential. 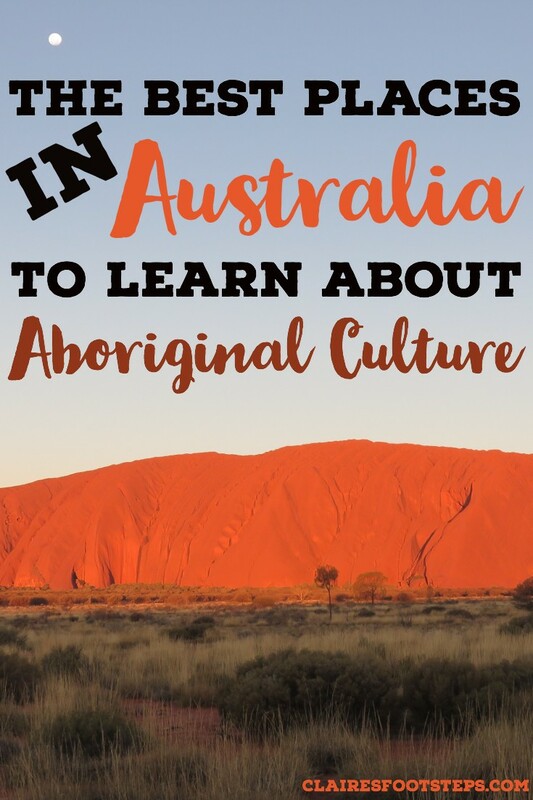 This is why I am and will continue to spread the word about the huge importance of learning about Aboriginal culture when travelling to Australia. I’ve saved and shared this as much as I can, because I think this is so important. Australia’s history with its Indigenous people mirrors Canada’s, and we both have a lot of work to do. 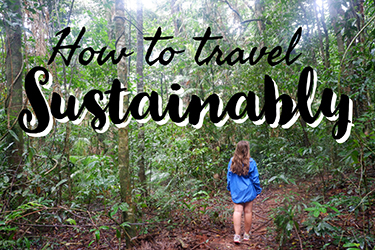 As tourists and travellers, we have a responsibility to be a part of the perspective shift and positive change! Thank you for this incredibly well researched post. I hope many people have the chance to read it! I loved this, Claire. I grew up in Echuca (which means “meeting of the waters” in Yorta Yorta) and had many Koori friends growing up. Unfortunately, when I moved to Melbourne I quickly discovered that not a lot of Australians have even met an Aboriginal person!! I was incredulous. This is a great post and I hope visitors to Australia have the chance to explore our history.